The first book by our founder and CEO, Kenneth Young, HAS LAUNCHED! You can Order the eBook & Paperback NOW at Special Launch Pricing on Amazon NOW! The book is focussed on how to raise investor money for your business. Step-by-Step Kenneth educates you on all the things you need to do, how to do each one, how to build and deliver a 90-second to a six-minute presentation that will help you raise the investment capital you need to build, launch and grow your company into a HUGE SUCCESS! This Special Pricing won't last so - ORDER NOW! I Want to Learn More Before I Buy! Books, Guides, Videos, Podcasts & More! 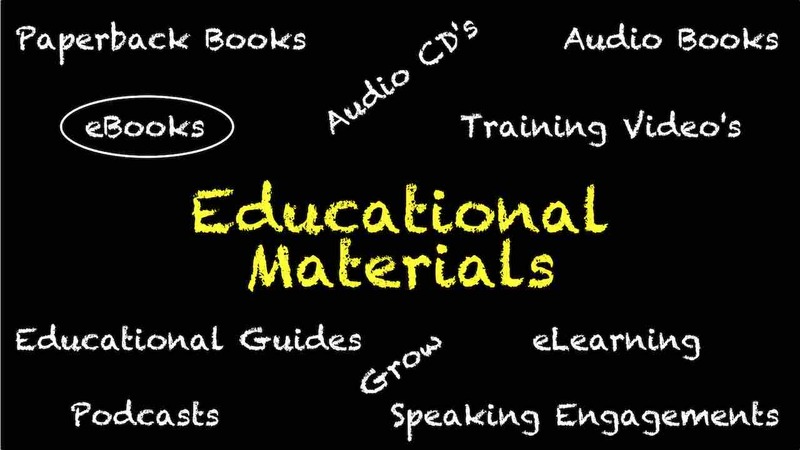 Our First Goal with both our Visitors and Clients is to EDUCATE! We know that this may be the first time you are engaging with us. You likely don't know us well, and we likely don't know you well. But we want to get to know you better! The fact that you have found our website likely means that you have a challenge (problem) you are facing. Our website is chockfull of Frequently Asked Questions in every section. We also have tons of blog posts on many common challenges our Visitors and Clients face daily. We are adding more every week? Want us to speak on a specific topic? Email us at blog@IdeaToGrowth.com and we'll see about writing about your topic in a future blog post. We want you to be fully educated on the challenge you are facing and what your options are to solving that challenge. Once you more fully understand the challenge you face and your options, you can decide the best way to move forward. Perhaps you have decided that we've helped you better understand your challenge and you want to solve it on your own. AWESOME! We're genuinely happy that we were able to help! Perhaps you have decided that we've helped you better understand your challenge and you want to learn more about how we can help solve your challenge for you. AWESOME! Go to the section of our site that handles challenge you are facing and purchase the appropriate product or service. In addition to our blog posts, we also have white papers on important subjects. Check them out on this web page. We also have a series of eBooks. Each eBook on a focussed topic and intended to be a problem-solving engagement. You'll find them on this web page also. 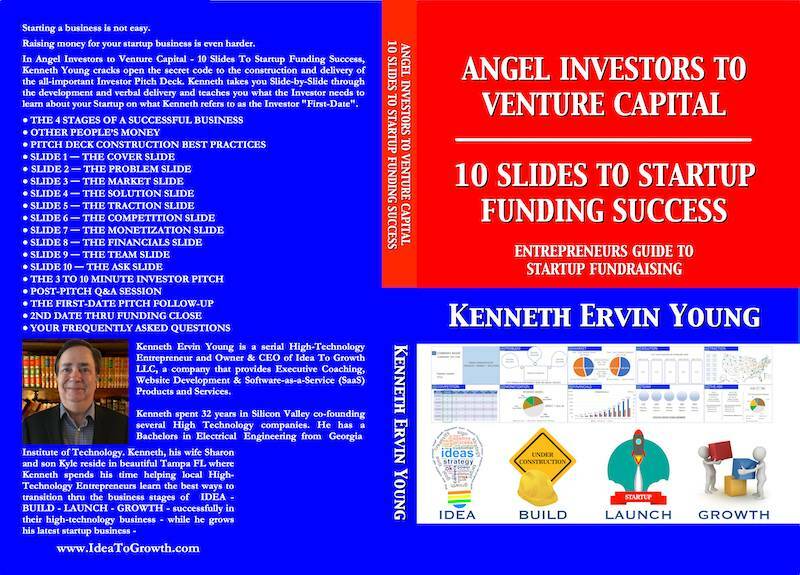 The first book by our founder and CEO, Kenneth Young, will be out in a few weeks. You'll be able to buy in on Amazon in paperback form in early January 2019. A link to the paperback book on Amazon will be available as soon as the book launches. The book is focussed on how to raise investor money for your business. Step-by-Step Kenneth educates you on all the things you need to do, how to do each one, how to build and deliver a six-minute presentation that will help you raise the investment capital you need to build, launch and grow your company into a HUGE SUCCESS! If you want to get this book before it possibly ends up on backorder, we'll notify you a day or two before it launches. Click the book image to be notified by email so you can grab a copy before it sells out! This sub-section contains all the Books authored by our Founder and CEO, Kenneth Ervin Young. The paperback versions of these books will be available on Amazon and sold directly at Workshops and Other Events in which the author attends throughout the year. You will also be able to buy Kindle and Kobo versions of each paperback book. Kindle and Kobo versions of each paperback should launch 3-6 months after the paperback launch date. Kindle and Kobo eBook versions will also be available for direct download from my website at the same time they are available on those respective websites. They're identical to the eBook versions you can buy directly from the Kindle and Kobo store, but if you buy directly from us, we don't have to give Amazon or Kobo 30% to 70% of the price you pay. In return, you get our many thanks and we're working on including some "freebies" that you would otherwise have to pay $$$ to buy from us. More on that as the details firm up. For paperback buyers who buy from Amazon, you will be able to buy the eBook version when it launches at a deeply discounted price. The author intends on each of his books to be "Living Books". This means he plans to add updates and additional material as he creates it. If you add the eBook after buying the paperback, you'll get all of his updates and additional chapters for the eBook version - for FREE! If you only buy the paperback, you will have to wait for a "Version II" of each book - if he ever publishes one! Don't miss out on updates and new material as he adds it to each eBook. Be smart and buy both! Psst! We will also have Audiobooks for each paperback. They are planned to launch at the same time the eBook versions do, but currently, we plan to offer audiobooks "exclusively" through our website. Our Founder and CEO "LOVES TO WRITE!" He is a devout believer in documenting all of the work processes in this and his other businesses. He was formally trained as an Engineer at Georgia Tech (BEE). "I'm a Ramblin' Wreck from Georgia Tech and a Hell of an Engineer" is their fight song. He wants to be sure that the work product that our customers get is exactly the same no matter who does it or when it gets done. In that light, he takes some of these work processes that are more "business general" and has, and is, creating an entire series of eBooks and White Papers on a variety of subjects. Some are oriented towards his Executive Business Coaching. Others are oriented towards the Website side of our business. Our Founder and CEO gets so many requests for coaching that it's impossible to help everyone! In fact, in the last few months, he has been cutting back on his Executive Business Coaching in order to be able to have time to devote to coming up with other ways to help more people at one time. One of his plans is to take his Business Coaching lessons and turn them into a series of videos. Why video training? Great question! Many of you are self-motivated to get things done. You're just lacking the experience and tools you need to properly direct your efforts to achieve the success that you know you are capable of achieving. For those who fit that definition, having video training is perfect! You can watch the video, pause, make notes, continue or rewind and replay - as often as you want! For many of you, video training is better than live training. In live training, information is coming at you "fast and furious"! Some might describe it as being like "Drinking out of a Firehose". You're scribbling notes as fast as you can and still miss out on many key points. You're so busy making notes you don't have time to think about or even comprehend everything you're being taught. Yikes! By creating videos, Kenneth can help an unlimited number of clients who are self-motivated. Now we know not everyone is self-motivated, but many of you out there are self-motivated and can easily learn by being educated via a video. Watch this space in the coming months for our video training. It's going to be "HOT!" We know that not everyone likes to "read". If we have the option, some of us would rather "listen" in order to learn a subject. Psst! Our Founder and CEO listen to over 100 podcasts "every week!" He loves them too! Watch this space for an announcement about a podcast we plan to launch in early 2019! 0We did say "and More" in the title at the top of this page. Well, part of the "and More" is all of the social media sites you can follow us on. The rest of the "and More" is still being worked on, but we can tell you that it is related to the Executive Business Coaching part of the business. Our Founder and CEO have not revealed what his "secret project" is yet but promises it's coming in early 2019, and it's going to be "very exclusive". Hmm, a good hint I think but we don't know. Kenneth is keeping it a secret. Knowing that his focus is on figuring out ways to help groups of people at the same time, rather than just one, you can bet it is going to be some sort of a "group-oriented" product or service. If you have a guess you want to share, click the button below and email me. Those who guess correctly I'll send each of you a "Surprise Free Gift" valued at $299. Remember you can only get the surprise gift if you email me via the button below. I can't wait to see what everyone guesses and how many get it right! ◉ I'm Not Sure if I'm Going to Raise Money for My Startup. Do I Need Your Book? This book is not just about how to raise money for your startup. It teaches you how to properly set up and run your startup so that when and if you decide to raise money, your company is already following a strong set of "Best Business Practices". The process of reading my book and building an Investor Pitch Deck will teach you how investors, clients, and customers are going to think about your product or service. This knowledge will be critical in determining your success or failure. ◉ I'm a serial entrepreneur and have raised money before. Why should I buy your book? I am a serial entrepreneur myself and my teams and I have raised $100M+ (USD) throughout my career. After our first team raised tens of millions of dollars (back in the '80's) I thought I knew it all. Two years after we took that company public (CY - https://finance.yahoo.com/quote/CY/) I thought I knew "everything". I couldn't raise a dime! Why? I did almost everything I talk about in this book WRONG! I didn't "know my potential investors". I had an 80+ page investor pitch deck. I didn't have "customer validation". The list goes on. Bottom line, I promise you will learn a lot from the mistakes that I've (and so many others) have made that I write about in this book. It's the best under $40 dollar investment you can make.